Does the mix tape still exist in a digital world? I like that idea very much! I have always been a fan of Mix-Tapes (and from time to time I listen to some of them I made in the 80’ies). The C60 Redux is the first MP3 player concept I find actually appealing enough that I want to go out and buy one! For a DIY project the 54 RFID-antennas used in the original concept are probably too hard to build, but I immediatly imagined a single antenna solution, where the user puts the RFID-tags on a conveyor belt. The conveyer should have a certain length, so the user can physically reorder the tags/songs to be played next. RFID jukebox! Got to think about this over christmas holidays. Really interesting object / project. If I find a blog post that tells it is done with arduino (I haven’t found it in the Nodesign blog) I’d really post & trackback here. It is impressive to see what has developed out of the initial idea described in imissmypencil! A lot of people apparently felt closer connected with their music collection on mix tapes or on vinyl. So a goal was to bring back the tactile joy of physical interaction into our music library. As an interaction design intern at IDEO I had the pleasure to be involved in the prototyping process. And we actually started with a single antenna solution prototype: The user puts his music tokens (with RFID-Tags) on a disc that starts rotating until the antenna (illustrated by a turntable cartridge) detects the first token of the users playlist. The disc stops and the music starts playing. When finished it starts rotating again until it finds the next song. Although we had some discussions about the right music to spin on it the turntable analogy with tangible jukebox features worked really well! offtopic, has the ethernet board project been abandoned? 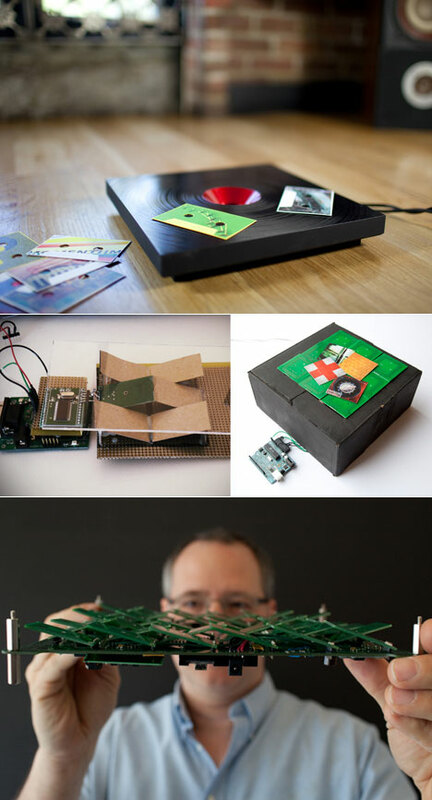 More details on the evolution of the RFID music player!